Whitewashed houses and bougainvillea-lined streets provide the backdrop for the popular seaside retreat of Bodrum. The quaint mix of the historical, cosmopolitan and traditional elements of this town allows visitors to move from sandy coves and ancient ruins to Turkish bazaars and trendy boutiques. 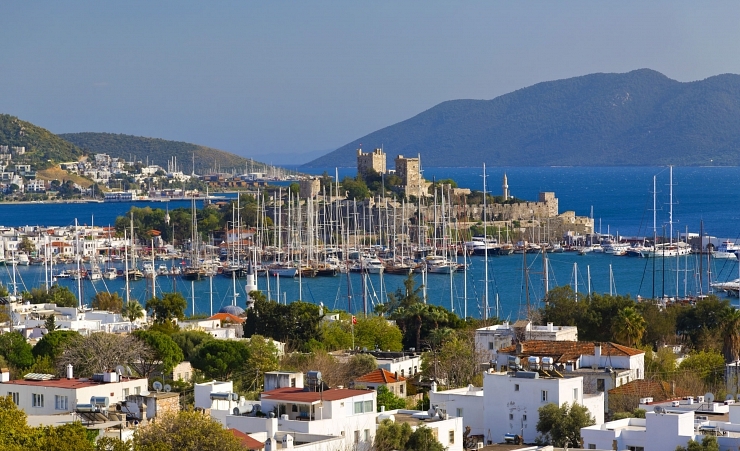 Bodrum's hot summers and mild winters ensure that holidaymakers can take advantage of Bodrum's attractions any time of the year. But, many tourists prefer to visit in autumn, between October and November when temperatures are cooler and there are fewer tourists. If you’d like to take a dip in The Mediterranean Sea, thought, make sure you go during high season (April-August) when it’s at its warmest. While in Bodrum, you have to take a day boat trip that heads out from the local harbor. There are several different options, from party boats to relaxing excursions. If you’d prefer to travel by foot, take a tour around Bodrum Castle. What was ruins 40 years ago is now totally renovated for visitors to enjoy. Of course, it wouldn’t be a trip to Turkey without a Turkish Bath! Most bigger hotels have Turkish Bath facilities, but there are also a few independent Turkish Bath’s around Bodrum. Overlooking the waters of the Aegean, Bodrum enjoys fantastic views, with several picturesque beaches just a short drive away. Akyarlar – just 20 km away - offers a series of small coves and beaches, while neighbouring Turkbuku – around 30 km away - is often referred to as the St. Tropez of Turkey because it offers a glitzier seaside experience. The beautiful Greek island of Kos is also a scenic 20-minute boat ride away. Whether you’re eating a Turkish breakfast or a meze for dinner, meals in Bodrum are best enjoyed alfresco style. And, it’s easy to see why! Enjoy a cool, summer evening on the seaside or on a rooftop terrace to soak up everything Bodrum has to offer. While in town, why not sample a bit of the local, Aegean cuisine? The mix of herbs, wild greens, fish and seafood is sure to delight your palate. Of course, if you’re not an adventurous eater, you’ll find a variety of menus to choose from, from Indian to traditionally English. To treat yourself, make a reservation at the terrace restaurant of Marina Yacht Club in Bodrum where you can enjoy a meal and some live music. After a day of sunbathing, shopping and eating, take in the sunset by the harbour, then make the most of Bodrum's vibrant nightlife in one of the town's many chic bars, local drinking haunts and nightclubs. There truly is something for everyone, including couples who want to dance the night away and families who want a kid-friendly show to enjoy after the sun goes down. Reminders of the town's long history are never long out of sight. St. Peter's Castle and the Museum of Underwater Archaeology house treasures recovered from over 3,000 years of shipwrecks in the coastal waters, while the Mausoleum at Halicarnassus is (or Tomb of Mausolus) counted as one of the Seven Wonders of the Ancient World. 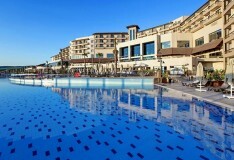 Bodrum is filled with fun outdoor activities. Take a private boat trip out on The Mediterranean or sign up for a diving class at one of the many diving centres. There are also plenty of opportunities to rent a kayak. If water isn’t your thing, why not rent a scooter or go off-roading? The cheapest way to travel to neighbouring towns and villages in and around Bodrum is via small passenger vans. You’ll find fares and routes posted on the windscreens of the vans. You can also find a number of taxi services nearby. The nearest international airport is just 26 km northeast of the town.